What is my Personal Injury Case Worth?| Rialto CA Attorney How much is my personal injury case worth? How much money am I going to receive for compensation of my injuries? Rialto personal injury attorney David Ricks explains this answer. Walking is a popular mode of transportation that can save money, spare the environment, and serve as healthy exercise. Unfortunately, for all of its benefits, walking isn't always safe. Pedestrian accidents have been on the rise all across the United States in recent years. According to the Centers for Disease Control and Prevention (CDC), nearly 5,400 pedestrians were killed—and almost 129,000 were injured—in vehicle vs. pedestrian crashes in 2015 alone. Sadly, the number of pedestrians injured or killed in these accidents has only continued to grow in the years since. Pedestrian accidents are an everyday occurrence in California. The state reported more than 350 pedestrian fatalities in the first six months of 2017 alone, earning it the unenviable ranking of 15th in the nation for pedestrian deaths. 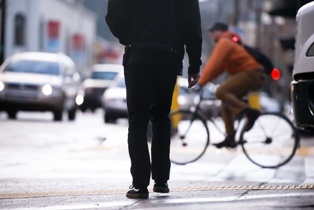 If you were injured—or lost a loved one—in a California pedestrian accident caused by another person or entity's negligence, you may be entitled to compensation. Here's what you need to know about common pedestrian accident causes before taking legal action. Who's Most at Risk for Involvement in a Pedestrian Accident? Additionally, research shows that most pedestrian accidents occur in urban areas at night, when visibility is greatly reduced. In cases where the defendant's behavior was particularly heinous, such as a repeat intoxication, pedestrian accident victims may be eligible for a third, rarely-awarded type of compensation known as punitive damages. Rather than being intended to compensate accident victims for an economic or non-economic loss, punitive damages punish the defendant and discourage similar conduct in the future. After a California pedestrian accident, a lot is riding on the outcome of your personal injury case. Don't leave the outcome to chance or to an experienced lawyer. You need a skilled personal injury attorney who knows the ins and outs of California tort law. The exceptional attorneys with the Inland Empire Law Group can provide the experienced, competent, and aggressive representation you need when fighting for the compensation you deserve. If you were hurt in a pedestrian accident, we can help. Contact the Inland Empire Law Group today at (888) 694-3529 or (909) 481-0100 to schedule an appointment for a complimentary initial case consultation.